Efforts on developing a machine which could record/produce sound started as early as in 1830 by Michael Faraday and in 1857 by Leon Scot.In 1856 an American scientist Rap Hadly surprised the whole world by somehow recording and reproducing sound.But the real credit goes to American scientist Sir Thomas Elva Edison who came up with his talking machine called "Phonogram" in 1878. In 1878 Emilaborlenar developed "disc's" to store sound.This further devoloped as gramaphone.In 1893 Danish engineer Waldimer Paulson came up with the Magnetic recording system to record sound successfully.His machine was known as "Telegraphone".Many such successful things came till 1957 when Stereo system was made available for the first time in the market. Capstan is a thin long needle which projects from the flywheel.It rotates the pinch roller.Pinch roller is a plastic cylinder coated with rubber.Capstan has a very smooth surface whereas on the other hand pinch roller has a rough surface.During play and recording the tape moves in a controlled manner between the pinch roller and the capstan.The pressure of the pinch roller on the capstan determines the speed of the tape. The capstan revolves at a very precise rate to pull the tape across the head at exactly the right speed. The standard speed is 1.875 inches per second (4.76 cm per second). The roller simply applies the pressure so that the tape is tight against the capstan.If the pressure is less than the prescribed value then the tape may start slipping resulting in an increase in speed, whereas if it is more then it may crush the tape. 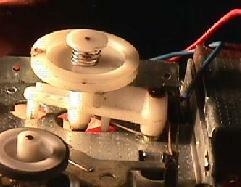 If you look inside of a compact cassette you will find that it is a fairly simple device. There are two spools and the long piece of tape, two rollers and two halves of a plastic outer shell with various holes and cutouts to hook the cassette into the drive. There is also a small felt pad that acts as a backstop for the record/playback head in the tape player. In a 90 minute cassette the tape is 443 feet (135 meters) long. 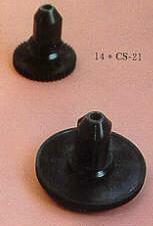 In the adjoining picture are the two sprockets that engage the spools inside the cassette. These sprockets spin one of the spools to take up the tape during recording, playback, fast forward and reverse.In technical terms these sprockets are called take up pulley and supply pulley respectively.The base of these pullies have a very large diameter and it is circumferencially covered by rubber.The contact of this rubber padding with the rewind and forward idlers gives motion to the pullies.Also note that there is a spring inside the pully assembly to provide flexibility to the system. Below the two sprockets are two heads. The head on the left is a bulk erase head to wipe the tape clean of signals before recording. The head in the center is the record and playback head containing the two tiny electromagnets. On the right is the capstan and the pinch-roller.Two tape guides can also be seen whose main purpose is to keep the tape straight as it passes below the magnetic head. Clutch is used to given rotatory motion to the take-up sprocket.It also maintains the proper tension in the tape while its been taken up by the take-up spool.As the radius of the tape already been taken up by the spool increases, the tension in the tape tends to increase.The clutch puts a check onto this by maintaining the proper tension to prevent breaking of the tape.Clutch is spring mounted so that if the tension in the tape increases to a dangerous limit then the disc on the clutch starts slipping.We can externally set the normal force being applied to the clutch disc by tightening the spring.We can also externally adjust the height of the clutch disc to the level of the conveyer belt coming from the motor. 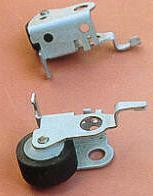 Brake is a very essential part in all the inertial mechanisms.It is used to bring the rotating sprockets to rest immediately after the motor stops.Without them due to inertia the pullies may keep on rotating causing damage to the tape.The braking of supply pulley ensures that unnessarily the tape may not come out of the cassette whereas braking of the take up pully prevents the chances of the tape been subjected to high tension.The design of the deck mechanism is such that the brakes are applied after all the rewind, forward, play and record operations. 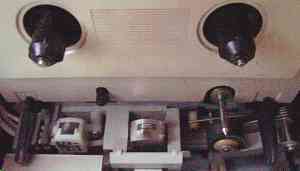 Playing of the tape requires that the tape moves at a slow speed.This is achieved by a pair of capstan and pinch roller.When the tape passes in between them it slows down to a speed of 4.76 cms/sec.The tape unwinds from the supply pulley and winds onto the play shaft .The tape portion in the midway from one shaft to the other is guided by the capstan ,pinch roller and a pair of tape-guides(see sketch1).During this movement it is exposed to and read by an electromagnetic play head. The f.fwd idler and rewind idler remain disengaged although the fast forward idler is continuously rotating.Also note that all the rotatory motion are transfered using frictional contacts and no use of gears is done.Also during play mode the auto stop mechanism of the cassette player becomes functional.The black rings of pullies which are seen in the corresponding figure are made of rubber to prevent the wear and tear of the play shaft and fast fwd idler which are made of brass.The diameter of the play shaft is very small to reduce the rotational speed of the take up spool. 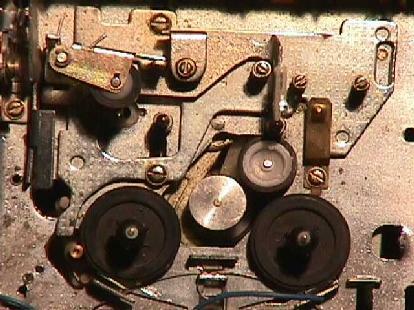 In rewind mode, the rewind mechanism re-winds the tape back to the supply pulley from the take-up pulley on which it was wounding during play mode.The head and the pinch rollers are away from the tape so that there is no reading as well as wear of the tape head.The supply pulley must now turn in the direction reverse to in play mode(as seen by comparing the supply pulley directions in play-mode and rewind mode sketches).This is done by indirectly engaging the fast-fwd idler (which supplies the rotation) to the supply pulley through rewind idler as seen in the sketch above.The speed here is about 15 times than in play mode so that we can rewind quickly. In fast forward mode we wind the tape on to the take-up pulley at much faster speed than in the play mode.The head and the pinch rollers are away from the tape so that again there is no reading from tape as was in the case of rewind mode.The fast-fwd idler is engaged directly to the take-up pulley so that the pulley continues to rotate in same direction as in play mode but with a much faster speed.Also note that the play shaft now disengages from the take-up pully.The rew.idler stays idle and the supply pulley keeps on supplying tape to the fast rotating take-up pulley.The speed of the spool is about 15 times as that in the play mode.This speed is near about the same as in rewind mode. Auto stop mechanism is seen at work when the engaged play/recording push button is self disengaged after all the tape is exhausted(in technical words when the supply pulley is completely unwound of the tape).When the supply wheel is unwound completely and it cannot release any more tape to the demanding take-up pulley ,there is an increased tension in the tape.This increases the normal reaction being applied to the auto stop lever and this lever moves in the direction as shown in the sketch above. As seen the auto stop lever is hinged so it will cause the intermediate lever to move down.This intermediate lever also moves down a floating lever which is hinged to the intermediate lever.This floating lever now obstructs the path of a auto stop pin projecting from the flywheel.The impact force causes the floating lever to push the button locking lever rightways.This unlocks the play/recording switch.In this fashion the auto stop mechanism works.It is a fairly complicated mechanism. Pocket books/guides are very easily available at all the major book stalls and with the audio service centers.